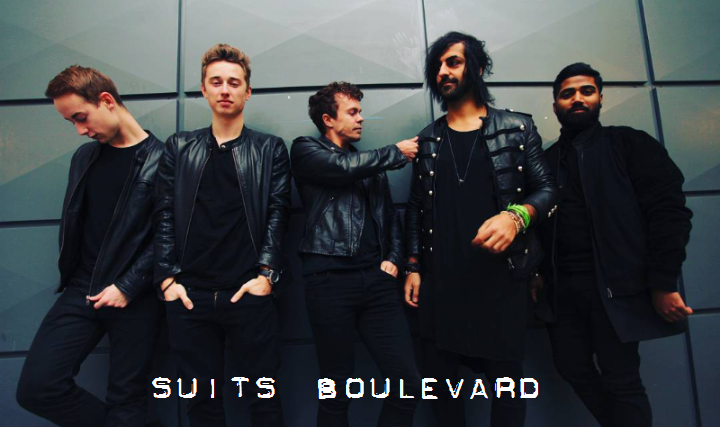 Danish SuitsBLVD (short for Suits Boulevard) with roots in central Denmark has made themselves noticed on record breaking time and taken an international liking on the international music scenery. – Been number 1 on the Canadian radio for 6 weeks and number 5 on the European radio for 3 weeks. – Played more than 60 concerts in 2015. – ”Broken Wings” has been recommended by DR (National Danish Radio). – Had 2 Artist Showcases in USA on “The Ed Tyll Show”. – Been broadcasted on Fox, CNBC, ABC and more.. in USA. – Been invited on a European tour. – Cooperated with Danish Cancer Society and played more than 20 charity concerts. – Currently on MTV, VH1, CMT, Vevo, Daily Motion, MuzuTV, VLADTV and more..
– A professional filmcrew doing a documentary on the band, which will be on TV when done. The bands approach to music is different, as its members have widely different musical backgrounds. Rap, Rock, Metal, Pop, R&B are amongst the genres of which the bands past originates from, which comes across in a beautiful, artistic way in Broken Wings. ”Our passion is music, and therefore our privilage to be able to share it with as many as possible. Companies don’t need to pay extra to listen to our album, and therefore, they will be able to download the album for free, the first week. We have worked hard with our tour, videos, singlereleases, press and recording of our album. Says Armin, Leadsinger in the band. The bands approach to music is very different, since they have different backgrounds. Rock, Metal, Pop, R&B are amongs the genres, the bands past and where they come from, which is beautifully put our on the debut album. The band, Bandet Suits Blvd was formed by Armin Kavousi (Vocal), Peter Scherfig (Guitar), Mads Albertsen (Guitar) and Mads Lindum (Drums) in December, 2013 with the vision to create music, which emotionally brought you back to a certain point in life. Summer 2014, percussionist Ashok Kumaran joined the band. January 2015, bass player Thomas Laursen joined. The name refers to a dream of livin luxurios on Manhattan or striving the boulevard, where all your dreams are memories you create for yourself. Its intangible, and at the same time appeals to a specific scent or experience, you had on ’that day’, you heard SuitsBLVD. Furthermore the band name and the group refer to creating music, which will create rumble on an international level. The band members have earlier had huge experience on different levels within the music business and in different genres – but are in SuitsBLVD, they all find the synergy. In less than 12 months the band has reached more than 10.000 followers on social media, and become MTV, VH1, CMT and VEVO present. They have filmed a documentary series on the facts of being an upcoming band, played more than 4 dusin concerts and written and recorded their debut album, which will be released later 2015. This has captured the attention of German booking and record companies.